What percentage of homes in Ballard, Seattle are purchased with cash? The Ballard neighborhood Seattle is a great place to live and is a sought after area by many Seattle home buyers. Currently, the Seattle real estate market is ranked as the hottest in the country, overtaking Portland, Oregon late 2016. Seattle home prices went up up 12.7% over 2016. Many buyers looking to buy a Ballard home and who may have lost out on a home already, are probably wondering what percentage of the homes for sale in Ballard are likely to be purchased by an all-cash offer. Also how do Ballard condos and single family homes compare. Finally, how does the Ballard neighborhood compare with other areas. The 100 most recent sales for each of Ballard and Capitol Hill (Seattle neighborhoods) and Bellevue (city on the other side of Lake Washington, for those of you who are newer to the area). Looked at both condos and single family homes (houses and townhomes) of all sizes and prices. Data was taken from the NWMLS on February 2nd 2017. 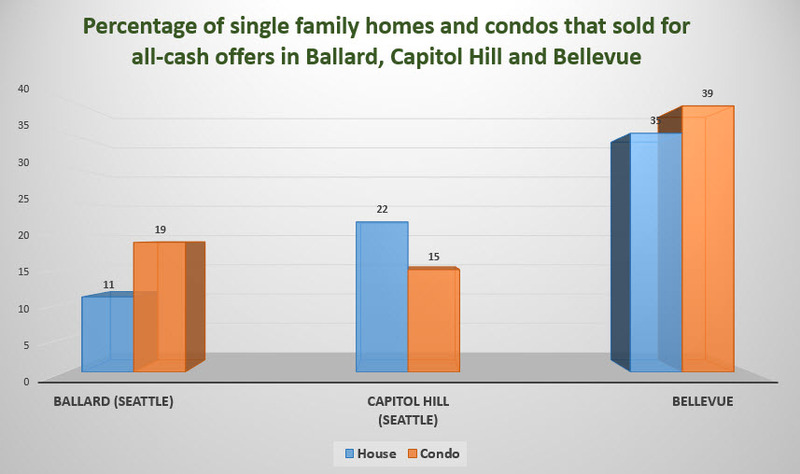 For Ballard, about one in ten single family homes sell for cash and about 1 in 5 condos (11 and 19% respectively). For the Capital Hill neighborhood in Seattle, twice as many houses sell for cash compared to Ballard but slightly fewer condos (22 and 15% respectively). When you pop over to Bellevue, it jumps up again with about one third of Bellevue homes selling for cash and 39% of Bellevue condos. That's a big chunk of the Bellevue market! Therefore, compared to other areas, the chance that a Ballard home buyer will loose out to an all-cash offer is a less than Capitol Hill and a lot lower Bellevue. So, what price range home are selling for cash in these areas? As you can see, there's plenty of cash floating around, including that whopping $6,100,000 cash purchase in Bellevue! So yes, there are cash offers out there and for different neighborhoods the level of competition will vary in different Puget Sound neighborhoods and cities. For the Ballard neighborhood Seattle, there's a 90% chance a home will be purchased with lender financing (a mortgage) and an 80% chance for Ballard condos. And don't forget, just because an offer is an all-cash offer doesn't mean it's the best offer. For you sellers out there, remember that the highest offer is not always the best offer. You need to look at the whole offer package. Don't just focus solely on the price. If you would like to see any Ballard or other Seattle homes, feel free to contact me.